SAN SALVADOR, Jul 3 2017 (IPS) - Trying to make it into the United States as an undocumented migrant is not such an attractive option anymore for Moris Peña, a Salvadoran who was deported from that country in 2014. “The situation in the United States is getting more and more difficult,” the 39-year-old construction worker from Chalchuapa, a city in the west of El Salvador, told IPS. Peña went to the United States in 2004, and worked for years in Rockville, Maryland on the east coast, in construction and remodeling. Now he has no steady income, and is trying without much success to make a living back home. He would like to go abroad to ensure a better future for himself and his family – but to a different country this time. In the first quarter of the year, 6,559 Salvadorans were deported from the United States, 13 percent more than in the same period in 2016, according to official figures. By contrast, deportations of Salvadorans from Mexico fell 99.2 percent in the January-April period, to 4,374, which local authorities attribute to the fear that Central Americans will fall victim to Washington’s stricter new policies against undocumented migrants, which has led many people to cancel or postpone plans to make the hazardous journey through Mexico. Peña is among those who are aware that making the trip now is much more complicated than when he did it over a decade ago. That is partly because the government of Republican President Donald Trump, in office since January, is militarising the border with Mexico and cracking down harder on the influx of Central American migrants, with actions similar to those taken by governments in the area, arguing the need to fight terrorism, drug trafficking and organised crime, civil society organisations complain. Much of Trump’s anti-Latin American immigrant rhetoric has remained just that, such as the wall he threatened to build along the border with Mexico. But on the other hand, the Trump administration is quietly pushing ahead with military actions to clamp down on cross-border movement from Central America, the director of the Salvadoran Migration Institute, César Ríos, told IPS. “You could say that there is a military wall between Mexico and Guatemala, and between that country and El Salvador,” to block the flow of Central American migrants, he said. 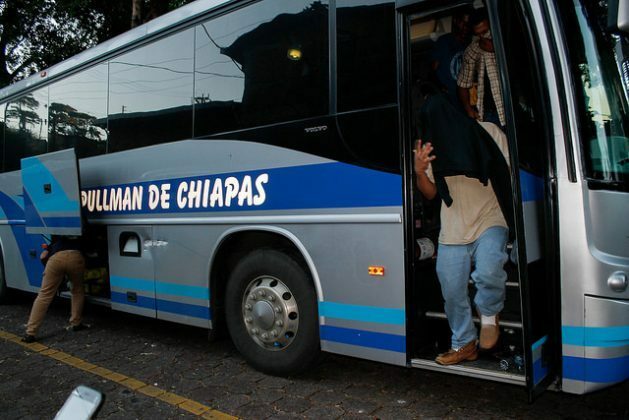 Ríos said there have been reports of cases of Salvadorans detained and deported as they head north through Guatemala – a new phenomenon. That shows, he said, that Guatemala is also backing the U.S. government’s effort to curb migration. In February, international media outlets reported that U.S. Defence Department officials and members of the U.S. Southern Command and Northern Command met with a Mexican delegation in the city of Tapachula, in the southern state of Chiapas, on the border with Guatemala, to discuss security initiatives. The meeting focused on Mexico’s commitment to close its southern border against organised crime as well as undocumented Central American migrants attempting to reach the United States. In April, during the Conference on Central American Security, the Chief of Defence Staff of the Guatemalan Armed Forces, General Juan Manuel Pérez, announced agreements between countries in the region and U.S. Defence Department officials to carry out air, land and reconnaissance patrols along the border with Mexico and share information and intelligence. According to the Mexican newspaper La Jornada, the conference, held on the island of Cozumel off Mexico’s southeast coast and co-hosted by the United States, also produced an accord for a military base in the northern Guatemalan department of Petén, where Pérez said a route used by undocumented migrants was found. “How can it be that to address such a complex issue as migration, the U.S. approach is military and countries in the area second the strategy?” Francisco Rico, director of the Regional Network of Civil Organisations on Migration, remarked to IPS. He added that it is no coincidence that the meetings on security policies have been held this year in southern Mexico, at spots along the major routes used by migrants. The Network is made up of 300 organisations from 11 countries, and represents the voice of civil society in the Regional Conference on Migration, an intergovernmental body that addresses the issue. Approximately 3.4 million Central Americans live in the United States, representing eight percent of the 43.3 million immigrants in that country, according to the U.S. non-governmental Migration Policy Institute, based on figures from 2015. The northward flow of migrants intensified in the 1980s as a result of the military conflicts in Central America, principally Guatemala, Nicaragua and El Salvador. Later, social problems such as soaring crime in several countries once again pushed hundreds of thousands of people to leave the region. Laura Jean Embree-Lowry, head of the Committee in Solidarity with the People of El Salvador (CISPES), stressed that before 2014, Mexico did not play such a central role in curbing the influx of migrants heading towards the United States. But that focus changed, she said, when Trump’s predecessor, Democratic former president Barack Obama, demanded that year that the Mexican government step up security measures against the flow of migrants. Under Obama, deportations doubled, with respect to the previous administration. This strategy to contain migration has fuelled a rise in cases of violations of the human rights of migrants, given Mexico’s terrible record in that regard, Embree-Lowry maintained. “In Mexico there are more and more military control posts and patrols, from the southern border up to the state of Oaxaca,” she said in a telephone interview with IPS from Washington, where CISPES is based. She said Trump insists on associating migrants who enter the country across the Mexican border with crime. For example, this month, she pointed out, the U.S. leader said his government would fight the Mara Salvatrucha, a gang that originally emerged in the United States and was spread to El Salvador and other Central American countries by people deported to those countries. “Trump’s discourse aims to cast immigrants as criminals and depict them as rapists and gang members,” said Embree-Lowry . It is true that the gangs are a threat to Central American societies, but not to U.S. society, she said. In June, the presidents of the countries of the so-called Northern Triangle, made up of Guatemala, Honduras and El Salvador, met in Miami with Trump administration officials to discuss issues of migration and security. The three nations are beneficiaries of the U.S. Alliance for Prosperity. In 2016, 750 million dollars were approved to finance the plan, but the funds will not be managed by the Central American countries, and will only partially go towards productive projects aimed at keeping people from leaving those countries. On the occasion of the meeting in Miami, 38 U.S. lawmakers sent a letter to Secretary of State Rex Tillerson to express their concern about the possibility of Washington stepping up cooperation with Mexico’s security forces, given the risk of increased human rights abuses against migrants. Moris Peña, meanwhile, is no longer considering the United States as a destination. His dream now? To reach Qatar, a country which, according to local migration authorities, will open its doors to Salvadorans with no criminal records who are deported from the United States or Mexico. He bought tools for his trade as a construction worker with the 1,500 dollars that the government grants to returned immigrants who sign up for a labour reinsertion programme. “Sometimes I get little jobs…we’re gradually trying to get ahead,” he said.